Today’s post is about the pre-Budget speculation, and the reality of today’s speech. We’ve published early today, so that readers could see my thoughts in advance of the speech. The post has been be revised this afternoon to reflect what actually happened. Rarely have I seen so much speculation about the content of a budget. I’ve read close to fifty articles this week. 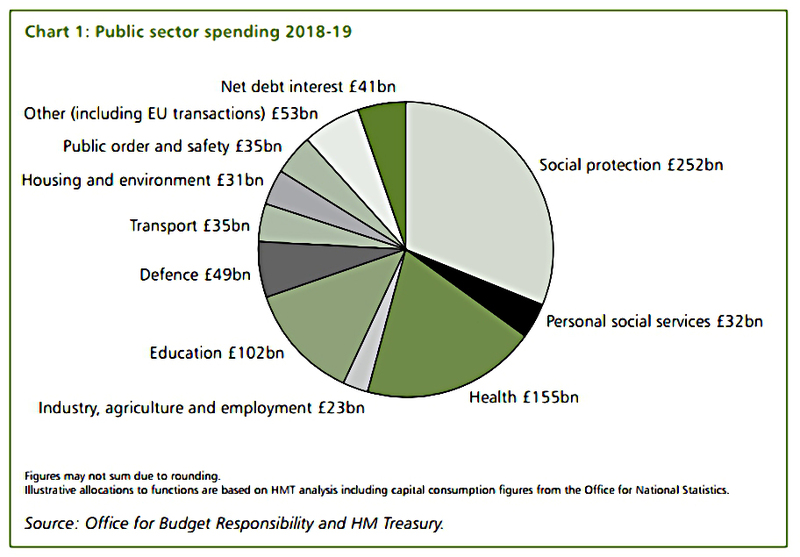 I suppose that the poor showing from the Tories – and the better than expected vote for Corbyn – in the recent General Election, plus the ongoing dissatisfaction on both sides with the Brexit negotiations, gives this Budget an “anything might happen” feel. But this has happened before, and usually we are disappointed. The silver lining of the narrow commons majority means that big changes to things like income tax, NI and VAT are unlikely. 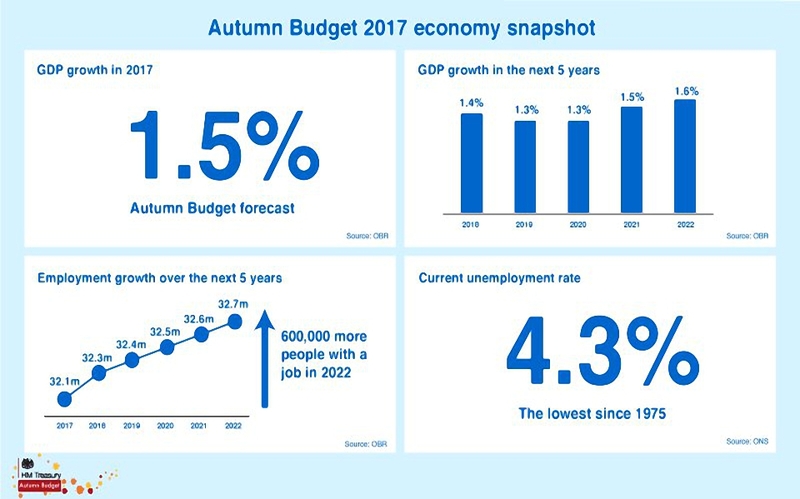 Hammond doesn’t have much wriggle room this time, as the Office for Budget Responsibility (OBR) is expected to downgrade its productivity assumptions (though this will be partly offset by lower unemployment / higher employment). Housing associations have been moved back in to the private sector, saving around £5bn a year, and perhaps something will come of this. Let’s have a look at what has been suggested, how likely the suggestions are to come true, and whether any of the ideas stand up. There has been speculation that tax relief will be increased for young savers and / or limited for older ones. “Young” has not been defined, but given the rules around LISAs we can take an educated bet on 40 being the upper limit. This is a bad idea – it’s ageist, and young people already have the greatest incentive in the universe, in the form of compounding. It will be a doubly bad idea if it’s funded by penalising older savers. Plenty of people will reach 40 without saving enough, and should be allowed to catch up from there. Apart from that, we have the perennial speculation that allowances (annual and / or lifetime) will be cut. Plus the old faithful that the 20% / 40% marginal relief system will be replaced by a flat rate 30%. The LTA is clearly too low already, whilst the £40K annual limit is generous – so I would see this as the fairest game. The snag is that since few people can max out their allowance each year, reducing it has only a minor impact on the government’s finances. So a reduction in the annual allowance might be paired with a reduction in the threshold for the tapered withdrawal of the allowance. This currently starts at £150K pa, but could be reduced to £100K. Of course, in the court of public option, £1M may sound like a lot of money, but simple arithmetic demonstrates that it is not. Perhaps the best indicator is that the government has just confirmed that the LTA will rise with inflation to £1.03M next year. I wish Hammond would abolish the LTA, or at least link it to contributions rather than withdrawals, but I don’t think this is likely. Thirty per cent flat income tax relief is reasonable, but – as with the relief on VCTs and EIS – it creates an artificial cash-flow barrier to contributions from higher-rate taxpayers. New this year is the idea that company contributions will no longer be exempt from NI, and possibly corporation tax. This seems unlikely, given the hard to predict and potentially large hit to corporate Britain. Personal contributions can be throttled back when tax law changes, but company contributions are largely contractual. And some people have speculated that workplace auto-enrolment contributions will be made compulsory (as in Australia). Baroness Altmann suggested that tax-relief might be available only to those paying in more than the mandatory minimum. I think that something along these lines is coming eventually, but the rollout must complete, and the level of contributions increase to 8% or more before this happens. The final pensions idea that I came across was that the DB conversion factor (currently 20x the annual payment) might be raised in line with today’s lower interest rates. The current ratio was introduced with the LTA system in 2006, and to establish a level playing field with DC pensions, it would need to increase to 30 or 33. Such a move would be very unpopular with the public sector, where DB pensions remain common, pushing many people over the £1M LTA. It would also likely increase the number of people with DB pensions who want to transfer out to a DC arrangement. Reality: As so often, anti-climax – nothing happened on pensions. – The LTA is rising to £1.03M as planned. 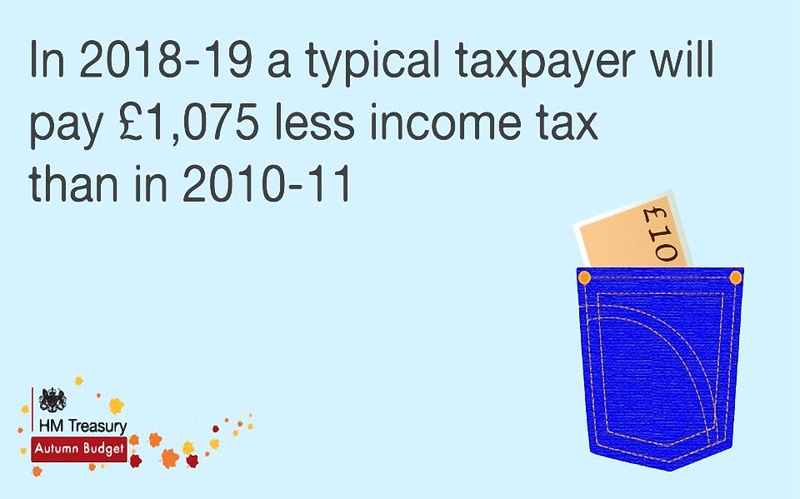 – The personal allowance on income tax, and the basic rate band are going up with inflation. Earlier this year the government published the draft report on “Financing Growth in Innovative Firms” . 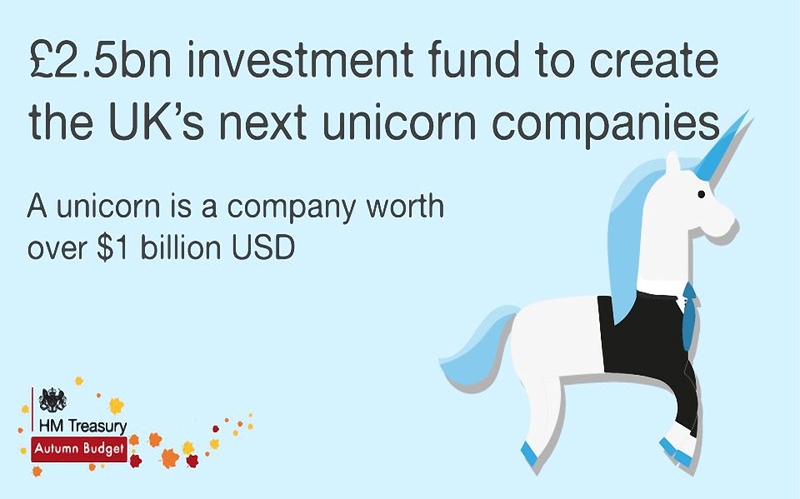 This was intended to encourage long-term funding of growth companies (known as Patient Capital). Many in the industry have interpreted the timing of the report (the final version is imminent) as bad news for the tax shelters (VCT and EIS) that provide much of the funding. In particular, asset-backed (lower-risk) EIS schemes are expected to be banned. This is fine as far as it goes, though pooled funds will probably need to replace single-firm EIS schemes if they are restricted to riskier opportunities. There’s also talk of banning film investment, though I’m not sure why – there’s not much riskier than movies, and the UK is a leading global producer. I’m puzzled why anyone would want to discourage VCT and EIS investment, since the firms they invest increase jobs, and pump money into the economy. The success of the IHT exemption for AIM firms (and EIS) shows that this would be attractive if extended to Patient Capital ITs. The best option would be more income tax relief, either to 40% (to match the higher tax bracket, and remove a cash flow constraint), or via an extension of the 30% relief beyond the current limit of the amount of tax already paid that year. Reality: EIS has been tightened up for asset-backed schemes, but loosened (investment limits doubled) for “knowledge-intensive” industries (tech firms). – There will be a £2.5 bn investment fund, as part of the British Business Bank. There has been some talk that the IHT relief on AIM shares will be lifted. I don’t think this is likely, since few people use the relief. But I will be pretty annoyed if it does happen, having done a lot of work in this area during 2017. Moving in the opposite direction, some have suggested that the chancellor should relax rules on intergenerational transfers of wealth. This might take the form of a temporary suspension of IHT (or extension of the nil-rate band) or an increase in the tax-free gift allowance (currently £3K pa, and not increased since 1981). Or the income requirement for regular gifts could be removed. All of these changes could be spun as helping millennials, though it would be hard to draft them closely enough to avoid other uses. The planned cut of the dividend allowance from £5K to £2K pa – abandoned because of the General Election – is likely to be reinstated. Hammond might go further, and increase the tax rate on dividends for basic rate payers to 10% (from 7.5%). Reality: The budget made no reference to the dividend allowance, which led lots of commentators (myself included) to think that it would remain at £5K in 2018/19. – It turns out that it was reduced in an earlier finance bill (post-election, pre-budget) and it will be £2K next tax year. ISA limits usually rise with inflation, but the recent rise to £20K means that Hammond can afford to freeze them this year. The LISA limit (£4K pa) might be increased as a sop to the young. Reality: ISA limits have been frozen. There seems to be a consensus that something needs to be done about housing, since it’s the issue at the heart of the growing inter-generational divide, but there’s no consensus on what to do. Options include more construction (but where?) 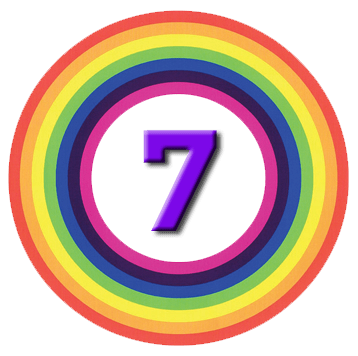 and reducing / abolishing stamp duty (possibly only for “the young” and / or for elderly downsizers – those whom the mainstream media like to call “bed-blockers”). This will mostly benefit people in the south, since the average prices paid by first-time buyers in the north aren’t much higher than the £125K stamp duty threshold. I’m also not clear how this works if you leave out those in the middle. First-time buyers of new houses can benefit, but what happens to those moving up the ladder in order to sell a house to a first-time buyer? There’s even been talk of making stamp duty a tax on the seller, but that has some strange effects – for those trading up, their bill is reduced, but for those trading down, it is increased. Probably not what the chancellor is aiming for. Will Hammond allow building on the green belt? I’m not convinced, but until more land is available, the government’s efforts to support the housing sector will mostly result in higher prices and more profits for housebuilders. The chancellor could always revive Osborne’s Northern Powerhouse idea, and convince people to move to areas where there are more houses already. Again this doesn’t seem likely. Other options include incentives for small developers and making it easier for large gardens to be sold off for development. That should go down well with the neighbours! Reality: Housing was pitched as the centre of the budget, but there were few concrete measures, and lots of urgent reviews. – The main exception is the scrapping of stamp duty for first time buyers on the first £300K of properties up to £500K. – The likely effect is that house prices will rise to absorb this tax cut, except those just above £500K, which will now be capped at £500K. – Stamp duty needs to be fixed all the way up the chain, not just at the bottom. 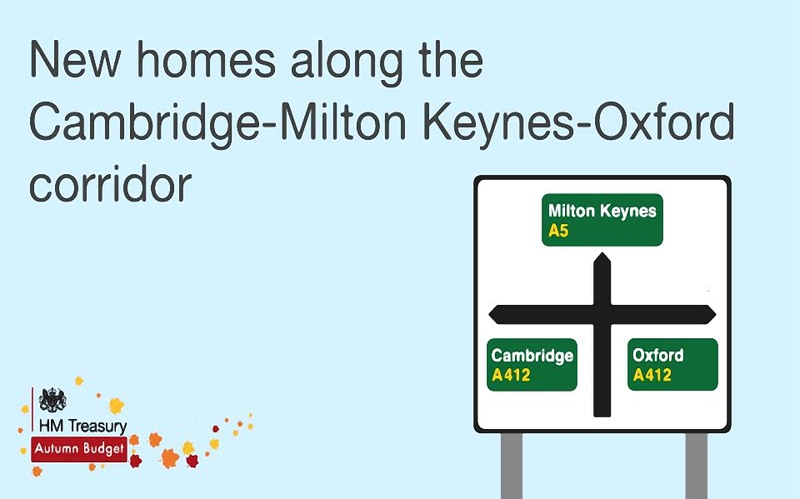 – There will be more houses built in the “tech corridor” between Oxford, Milton Keynes and Cambridge. – And there’s a bit of money for northern railways, including the trans-Pennine route. Apparently Hammond is considering reducing the VAT threshold from £85K pa, down towards the EU average of £20K. The thinking is that this would avoid a “cliff-edge” which encourages under-reporting. 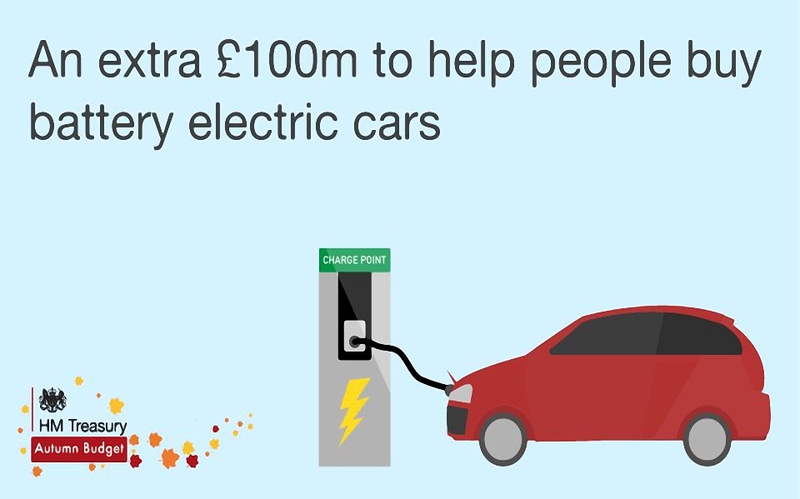 The change would bring in £2bn a year. More red tape is the last thing that small businesses need, and Hammond risks the same backlash as he received on increasing self-employed NI. Plus it’s likely to encourage more black market activity. I think the limit should be much higher – say £250K. Reality: No change today, but another review is planned. It’s quite possible that we’ll see some reforms to the student loan system, but probably falling short of cancelling all existing debts (as once promised by Labour). That would look like a nasty hole in the Government’s accounts, but in practice the system works like a graduate tax already, since poorer graduates fail to repay their loans. It’s already been announced that the threshold for repayments will rise from £21K to £25k pa from next April. Some have speculated that the 4% rise in Business Rates planned for the next tax year could be scrapped. The retail sector is certainly suffering, and would welcome this. Reality: I didn’t spot much here – an indexing switch from RPI to CPI will be brought forward, and a £1K rebate for pubs will be extended. Apparently there may be a new tax on plastic takeaway boxes and bubble-wrap. The 5p tax on plastic bags is seen as a success. 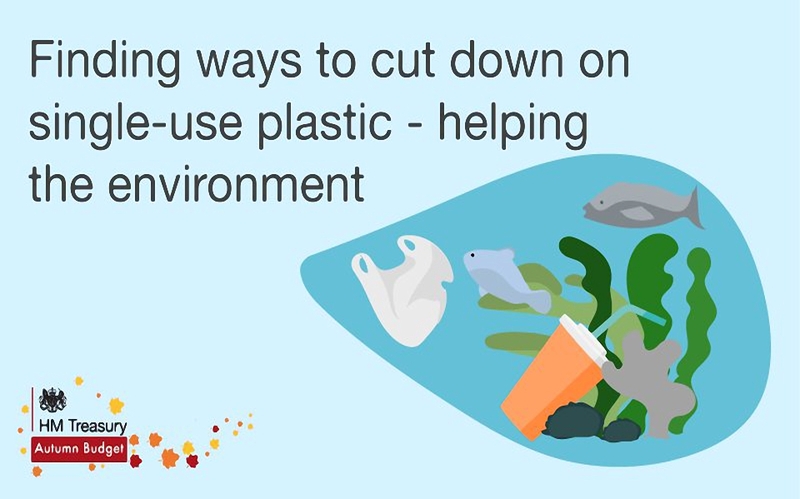 Plastic waste is definitely a problem, though possibly not the number one priority at the moment. What happened to that biodegradable stuff we had 30 years ago? Hammond is only expected to consult on the issue in this Budget, not impose a tax straight away. Reality: The plastic tax didn’t happen, but there will be a review. – Electric cars will be encouraged to reduce pollution (or move it from cities to where the power is generated). This section is reserved for ideas that I didn’t think would get anywhere near Hammond’s speech. First up is replacing CGT, IHT and dividend taxation, with an annual tax of 1.2% on wealth above £700K. This comes from Roger Farmer at the National Institute of Economic and Social Research. There are no exemptions for your primary residence, or for SIPPs and ISAs, but presumably public-sector DB pensions would escape the levy. The £700K threshold has been chosen arbitrarily as being the wealth of the 95% percentile in the UK. There is no thought as to whether that actually makes someone rich (it does not, in the South of England at least). Luckily I can’t see a Tory chancellor (even one from this government) introducing a wealth tax. If / when such a thing does come to pass, expect a lot of product innovation in the area of turning capital into guaranteed income (annuities 2.0). And you can also expect a housing crash that will cripple the UK economy. Pause the roll-out of Universal Credit to fix delays in benefits payments. Fund public sector pay rises. Put more money into infrastructure such as road and rail projects. Increase funding for health, education, and local government. 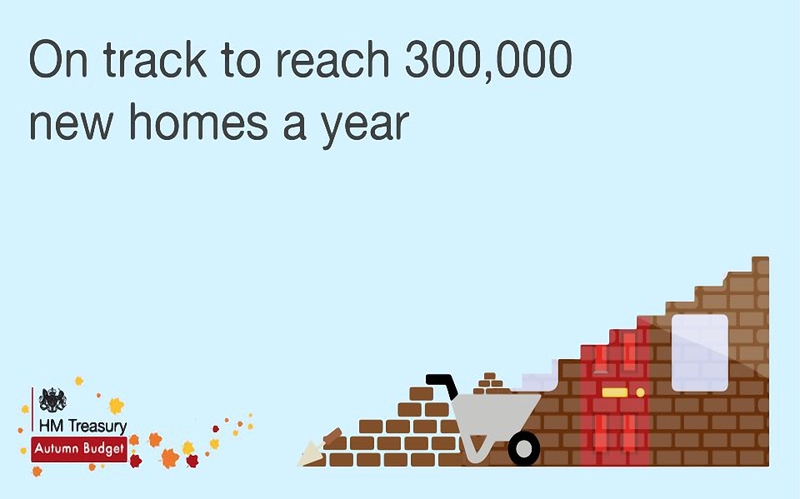 Launch a large-scale house-building programme. These would all be fine (apart from Universal Credit) if there was money available. But there isn’t – we need to continue to work towards balancing the books (what the left calls “austerity”). 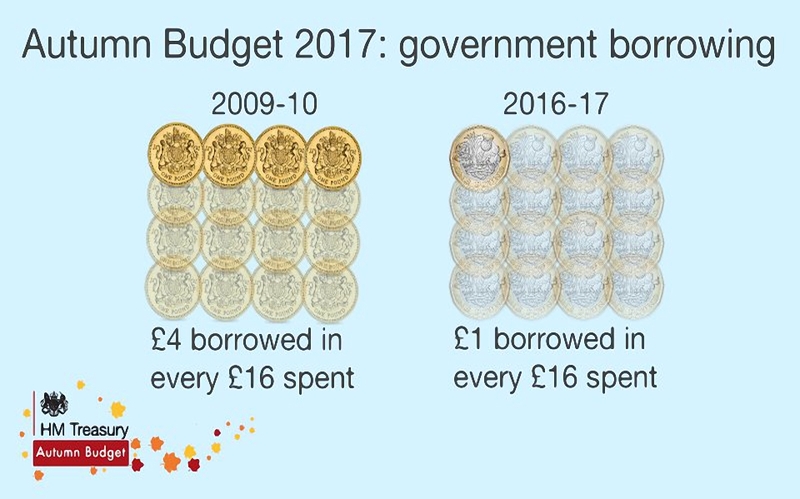 I don’t understand how the recent focus on intergenerational fairness hasn’t led to a wider understanding that borrowing is stealing from the future, and from future generations. Some in the property game have been wishing for a temporary amnesty from CGT for small-scale BTL investors who now want to get out. This would have interesting and mostly beneficial consequences, but I doubt that the government wants to be seen to be pandering to the BTL crowd. Michael Johnson of the Centre for Policy Studies made his regular plea for the existing pensions system to be replaced by something more like the LISA. I think this is a possibility in the long-term, but unlikely this year, with workplace auto-enrolment yet to complete. Circling back to the idea of the Northern Powerhouse, Policy North wants to turn nine big ports in the north into free-trade zones. I remember similar ideas floating around before we returned Hong Kong to Chinese rule, but nothing came of it. Perhaps Brexit will provide stronger motivation, but I doubt it. The IoD has suggested a related form of stimulus by improving the terms of EIS and SEIS within specific depressed UK regions. I imagine this might normally fall foul of EU state aid regulations, but perhaps the Brexit negotiations now provide cover. Reality: None of this happened. And that’s it – the combined wisdom of around 50 speculative articles. 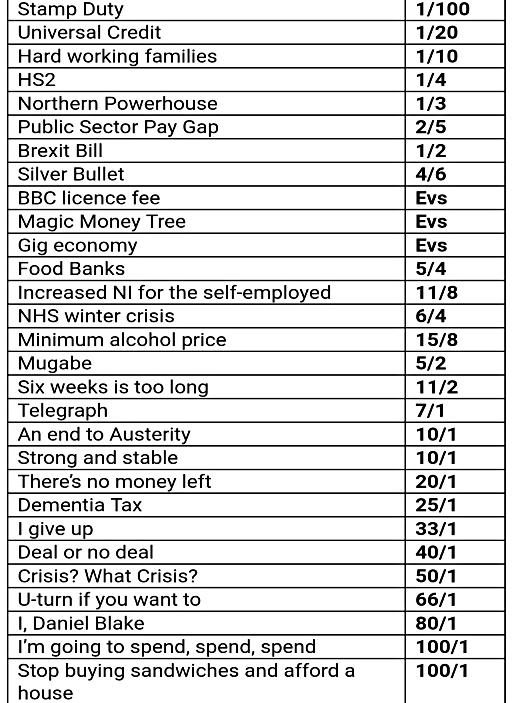 Here’s the pre-budget bingo betting card from one of our leading providers. 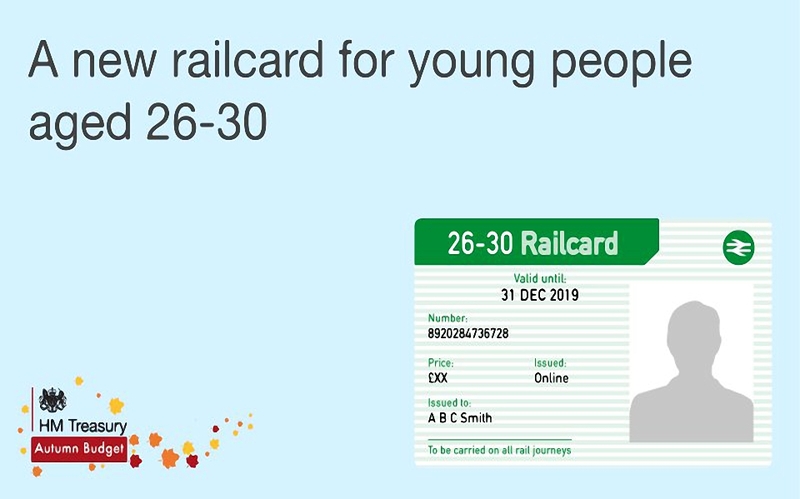 Reality: A vaguely insulting plan to introduce a railcard for millennials was announced. And that’s that – a quiet budget, but I’ll happily take the lack of tinkering with pensions, AIM, VCT and EIS. 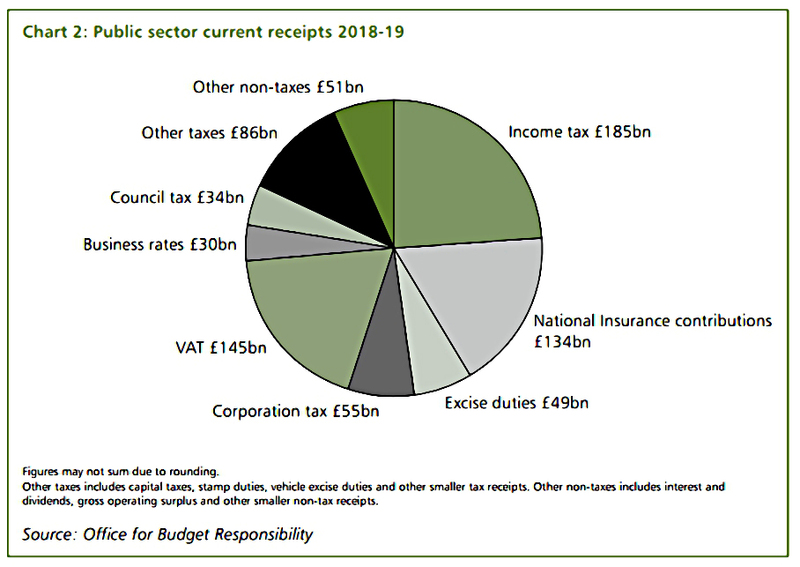 Today's post is about this afternoon's Budget, the last ever in the spring time. Welcome to Budget 2017.